we also can produce various kinds of screws as per as customer's design and samples. * Any questions or need more information, please feel free to conact with us. *We a re looking forward to have a good cooperation with you. Shipping: We will give you best service, tracking all the procedure for customer. We help kinds of custom to design their special screws for cooperation. Custom demand is our purpose 3. How long have you started the foreingn trading9 Aout 9 years. 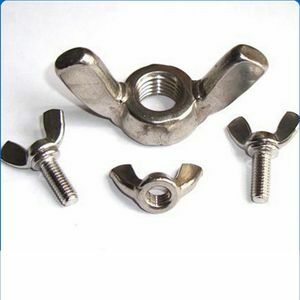 1.The specification of stainless steel wing nuts bolt screw Product name stainless steel wing nuts bolt screw Specification M6 Material low carbon steel, medium carbon steel, alloy steel Material grade Grade 4.8,6.8,8.8,10.8,12.9 Color Plain, self color Length 30 Standard ISO,GB,DIN,JIS,ANSI Cetificate ISO9001-2008,SGS,ROHS Function Aatomobile,electronic,mechinery After sale service If there are unqualified,we take full responsibility for it. 2.packing : General packing: Plastic bags+cartons+pallet+containers 3.The Process we use: Cold heading, Cold forging, Hot forging, Forming, Cutting, Shrink diameter, Threading, Thread rolling, Drawing, Pickling, Passirating, Waste water treatment, Grinting, pseting, Slotted, Sharing, Kurnling, Polishing, Punching, Tumbling, Trimming, Milled. Etc. 4.The material we have: Carbon steel, low carbon steel, medium carbon steel, alloy steel, heat-treated steel, low carbon martensite steel, austenitic stainless steel, martenitic stainless steel, iron, aluminium, brass, copper, bronze, plastic Factory Packing Certification Transportation We are at your service in 24 hours. 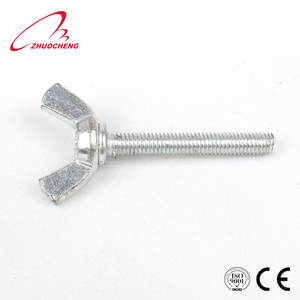 Products Professional wing nut screw excellent quality manufacturer Size Standard. ANSI stainless steel SS304/316 wing screws photos: Packaging & Shipping After-sale Service 1.Free reason for return within 7 days after received the goods. 3.Product quality tracking. 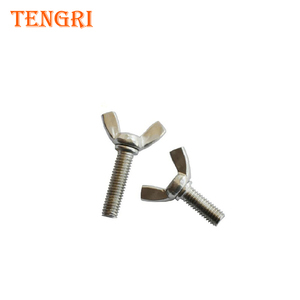 Our main products is hex cap screw/hex head bolt , we can do it in steel, stainless steel, copper, aluminum, plastics and etc. 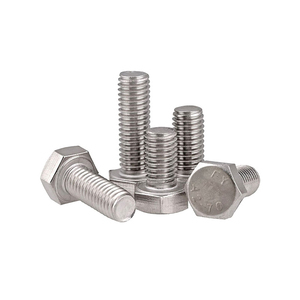 Our hex cap screw/hex head bolt are with technical drawings to ensure its quality. 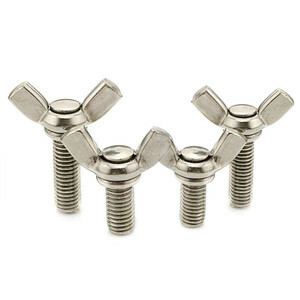 We are here welcome your inquiry of hex cap screw/hex head bolt and other fastening products. Surface Finish C. Specifications D. Any question related to our parts, our experienced engineers are ready to help. 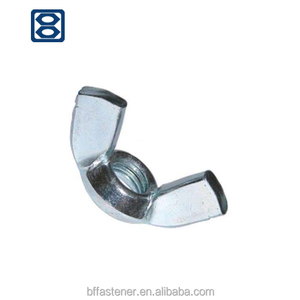 Haiyan Chunhai Fastener Co., Ltd.
Dongguan Chaochanglong Metal Products Co., Ltd.
Dongguan Gold Metal Products Co., Ltd.
Alibaba.com offers 1,282 wing nut screw products. About 22% of these are screws, 18% are bolts, and 1% are machining. A wide variety of wing nut screw options are available to you, such as free samples, paid samples. 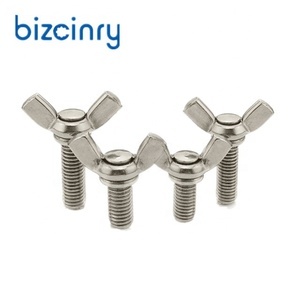 There are 1,304 wing nut screw suppliers, mainly located in Asia. 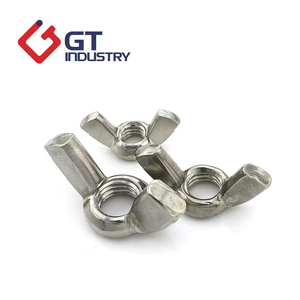 The top supplying countries are China (Mainland), Taiwan, and India, which supply 96%, 1%, and 1% of wing nut screw respectively. 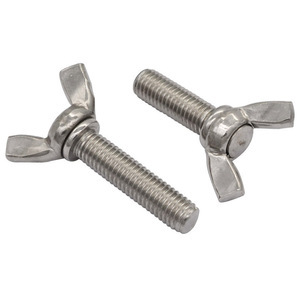 Wing nut screw products are most popular in North America, Domestic Market, and Western Europe. You can ensure product safety by selecting from certified suppliers, including 599 with ISO9001, 127 with ISO14001, and 69 with ISO/TS16949 certification.